MAGIC UNION solid rubber threshold ramps are a safe and easy way to transition a raised surface with a power scooter, wheelchair, walker, or by foot around the home and office. Each threshold ramp features beveled edges for a smooth and gradual approach to and from a raised surface. The one-piece design is portable, handy, and creates a finished look at the base of a doorway. Molded channels in the ramp surface allow water to drain away and provides excellent traction in any weather. Make doorway access easy with a Silver Spring rubber threshold ramp! Made with durable 100% recycled rubber for years of reliable use. Smooth design with beveled edges for safe access from all sides. 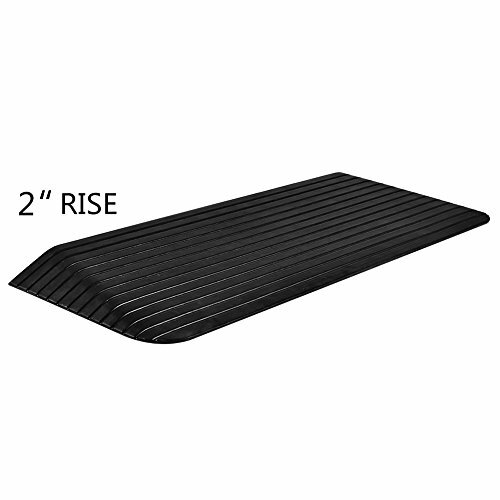 Slip-resistant surface and drain channels design added traction in both wet and dry conditions. If you have any questions about this product by MAGIC UNION, contact us by completing and submitting the form below. If you are looking for a specif part number, please include it with your message.